Fig.1 – This is a “big picture” chart to conceptualize gas bearing technology in turbo equipment. It is a lift vs load chart for an externally pressurized porous (EPP) gas bearing that has 10 square inches of bearing face, 100 psi is fed to the bearing as the load on the bearing is increased. Resulting air gaps are shown on the bottom axis in microns. The slope of the curve is representative of the film stiffness. The typical operating regions of dry gas seals and foil bearings are superimposed as is the operating area for EPP Bearings. It can be seen that the EPP Bearings operate with a larger gap than dry gas seals, reducing heating and contact issues but still having good stiffness, damping and speed capabilities. 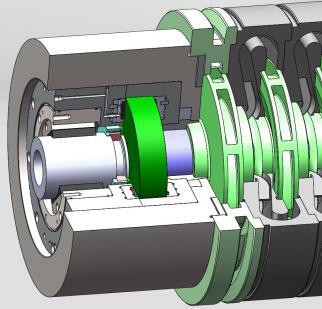 Fig 2 – An externally pressurized thrust bearing looks and acts much like a double opposed face seal, when positioned on the high pressure side of a straight though centrifugal compressor, radial real estate on the thrust disc can be used as the balance piston shortening the required length of shaft enough to make a big improvement in rotor dynamics.